This isn't a tabletop, but it's something special for Christmas. I have a very "Plain-Jane" fan-light fixture in my dining room. 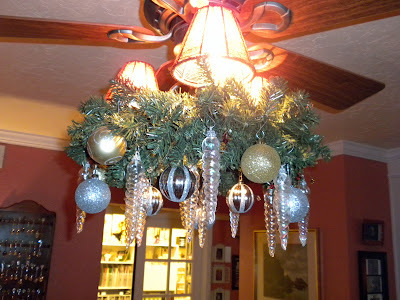 I dressed it up just a bit with some new beaded lamp shades a while back, but it didn't really help a bunch. Because of the location of this room, we really do need this type of fixture. Oh well, it can at least get dressed up for the holidays. 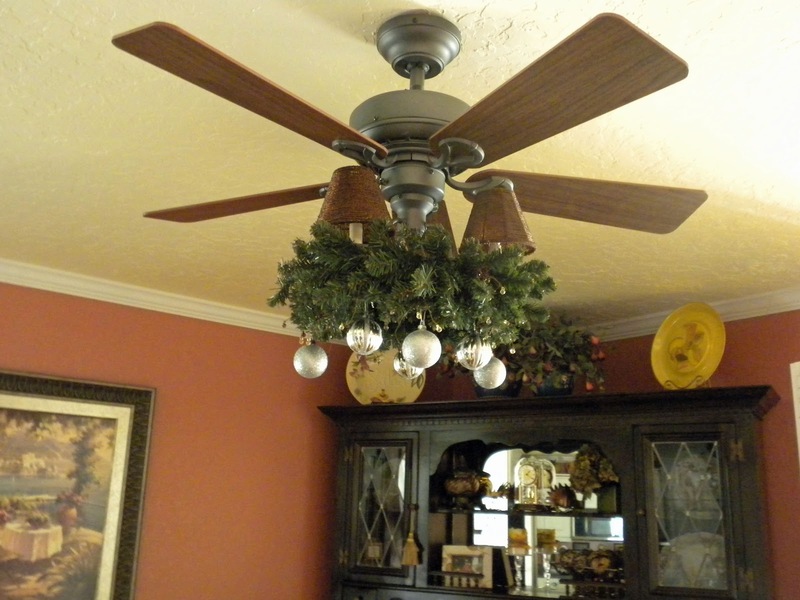 This first pic is the "undressed" fixture. Don't laugh, it might get embarrassed. This is the first layer. Still needs a lot more. 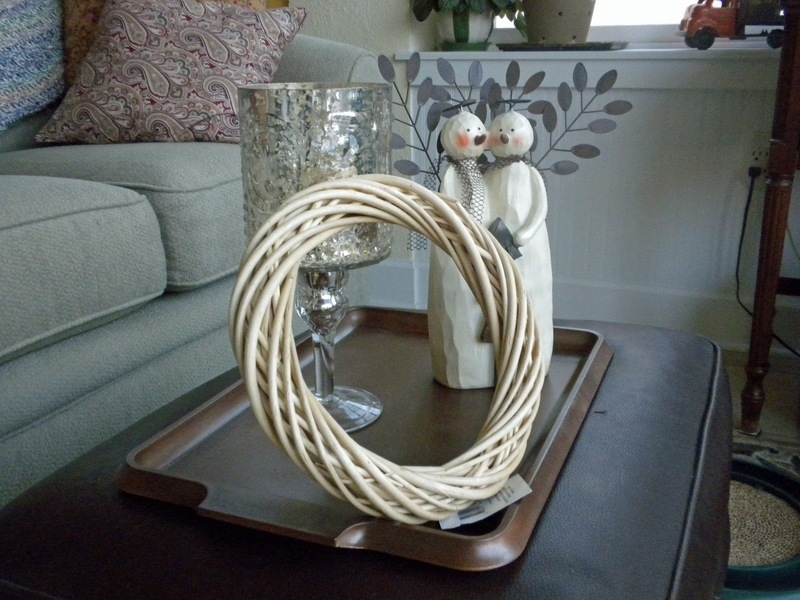 I used one of the wreaths I bought at GW for $2.99. It's nice & full. Okay, now we're talking. Sorry about the lighting -- this room is so challenging for taking photos. 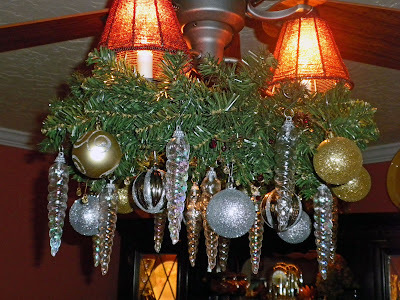 All the ornaments are from the $Store & Walmart. I really like the swirly icicles. They are clear & really capture the light. I used gold & silver balls. I used a different camera setting for this shot. I'm really liking this. Yep, here I go again with the weird shots. No, I didn't go into strange contortions to get this. 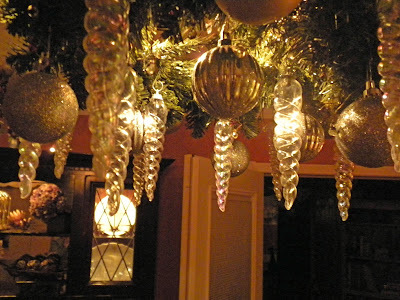 I just put the camera underneath & started clicking -- finally got one I liked! 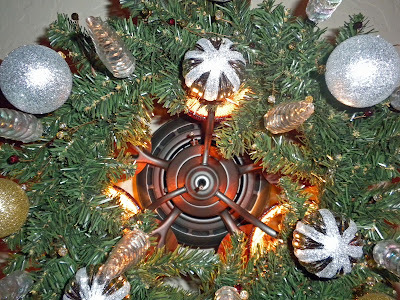 Just one more quick look at the finished "dressed for Christmas" fan-light. Maybe you can make a silk purse out of a sow's ear. Uh oh, I bet a lot of you youngsters out there never heard that one. Just think about it & you'll get it! Thanks for stopping by and come back soon. On Dasher & Dancer & Christmas Decorator! I hope everyone had a wonderful Thanksgiving. 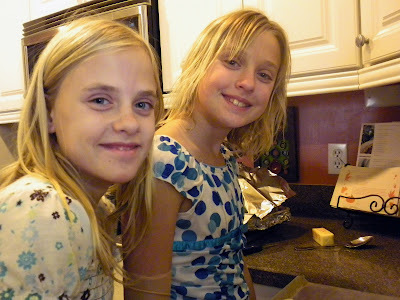 We had a terrific day with our daughter and family visiting & celebrating with us from Scottsdale. We talked, laughed, worked on a jigsaw puzzle, picked oranges, and ate tons of good food. 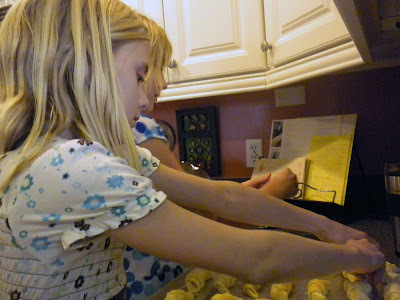 I even enlisted my 11 year old granddaughters, Riley and Taylor, to help make the rolls and mash potatoes. 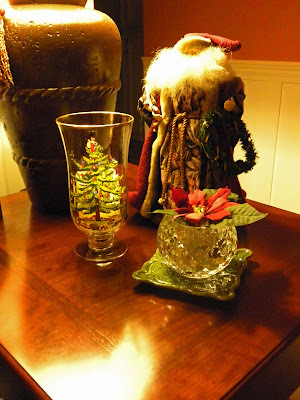 Now it's time to start the Christmas decorating. 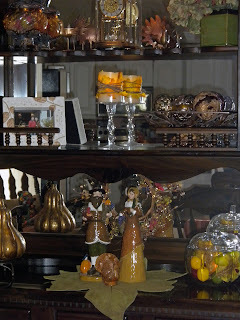 First, all the Fall/Thanksgiving items have to be put away. What a mess! This is the beginning of my process. 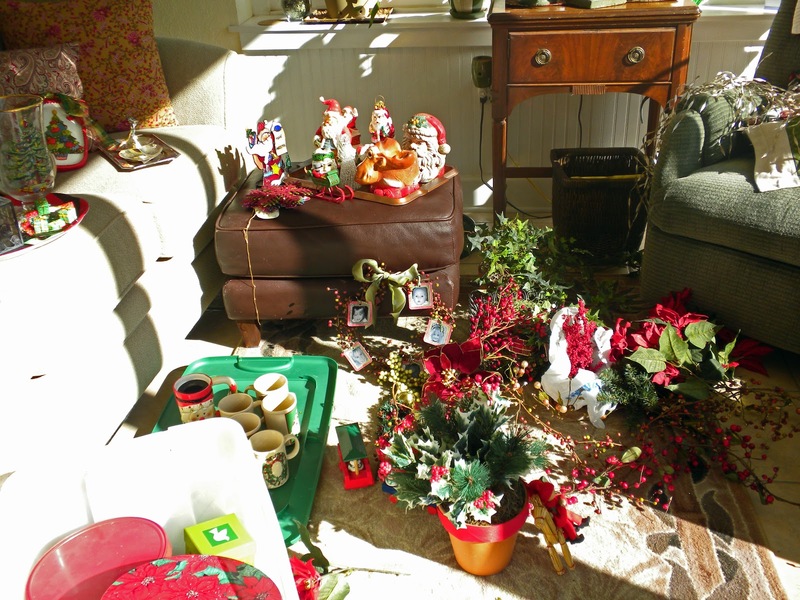 I store all the Christmas decorations in boxes, labeled according to the rooms or areas of our home where they typically go. I generally put the boxes in those rooms & unpack from there. Well, as you can see, that idea was thrown out the window this year. I just started digging through boxes & did a bit of sorting right on the floor & sofa of our sunroom. I plan to make some major display changes this year, so it's actually easier to plan what I want to do. Oh, who am I kidding? This is just chaos!!! 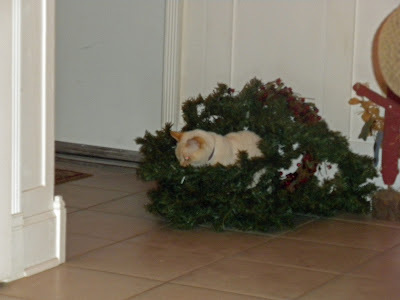 Yes, it was all fun & games for our precious little "furball"! Abby really wants to help, but she has no thumbs, so she's limited in what she can do. The first room in our home to be finished (always subject to change) is our living room. The entry table (aka "Old Singer") is where I like to display my snowmen collection. 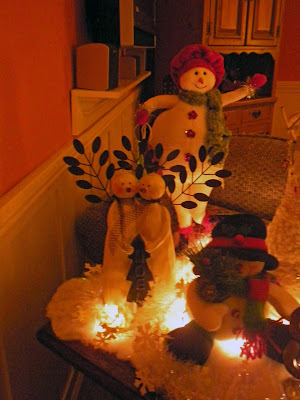 It got some more tweakin' this time around & the addition of a "Snow Couple." I found them at Ross's. I added the little tree decorated with spray snow, some lights & little glittery snowflakes (Target after "Christmas sale"). 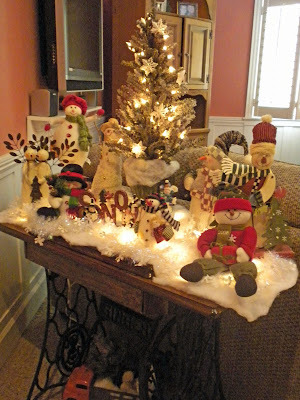 I'm putting our large tree in our dining room this year, so this snowman-scene tree is it for the living room. 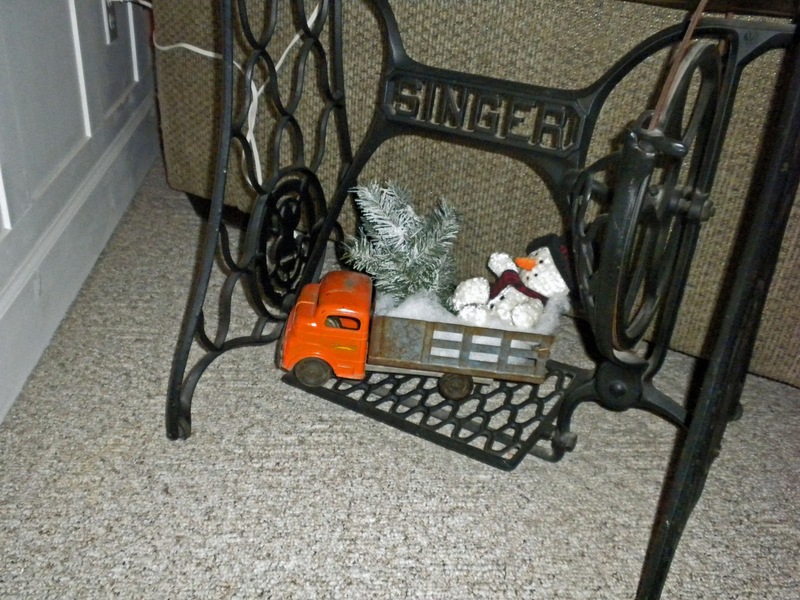 This little toy truck is about 58 years old & was a present to The Man from his older brother when The Man was about 5. I always use it somewhere in our home decor. The new snow couple & my favorite -- the "Shopper" with her cute red tam, scarf & bag. 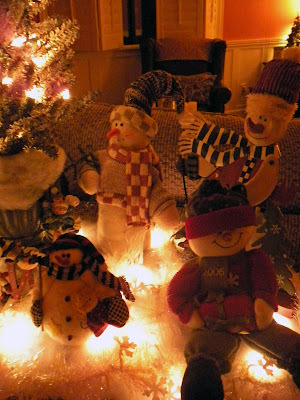 I don't know why I'm so drawn to snowmen, but I just find them so darn cute! Well, here is my "bargain" Father Christmas. 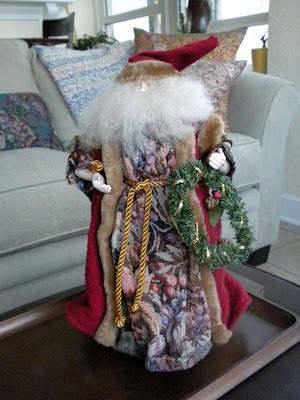 Remember, I found him at GW for $3.99 & then reduced to $2.99 with my senior discount -- what a steal! This is a Spode hurricane which I received as a gift from a very dear friend. I just love the colors in the scene. I prefer using a battery-operated candle in this, just to be safe. 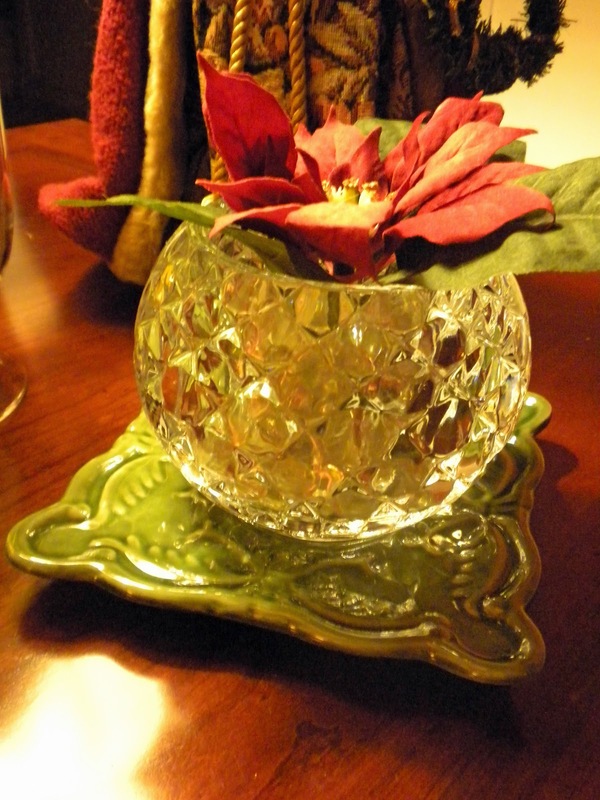 The same sweet friend gave me this little cut-crystal dish. Sometimes I put a votive or tealight in it, but decided this year to add the single faux poinsettia. I have it sitting on a petty, little plate that I also found at GW. That's a "wrap" for this time. Have more decorating to do & will happily share as things get finished. As always, thank you for stopping by & please come again soon. 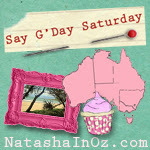 Also, if you are a new follower & do not have a blog, I just want to say "thank you" for signing up. I appreciate all of you very much. I'm so excited to have been featured on Crafty Storage. 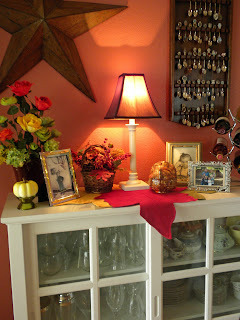 This is a website that I have gone to visit numerous times as I planned & re-planned my craft room (aka "Play Room"). For any of my fellow "Blog Sisters" who are interested in creating a space for your hobby, this is a terrific place to explore the possibilities. It's such a wealth of information, with lots of photos & links, to creating whatever kind & size space you might want or need. 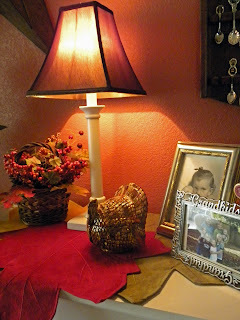 Take a look if you have a spare minute now that Thanksgiving is over & the chaos of Christmas has gone into full throttle. This will be my last post until after Thanksgiving, but wanted to share the "wrap-up" of all things Fall. Decided to get my dining room table all set & ready ahead of time so as to have one less thing to do on "Turkey Day." 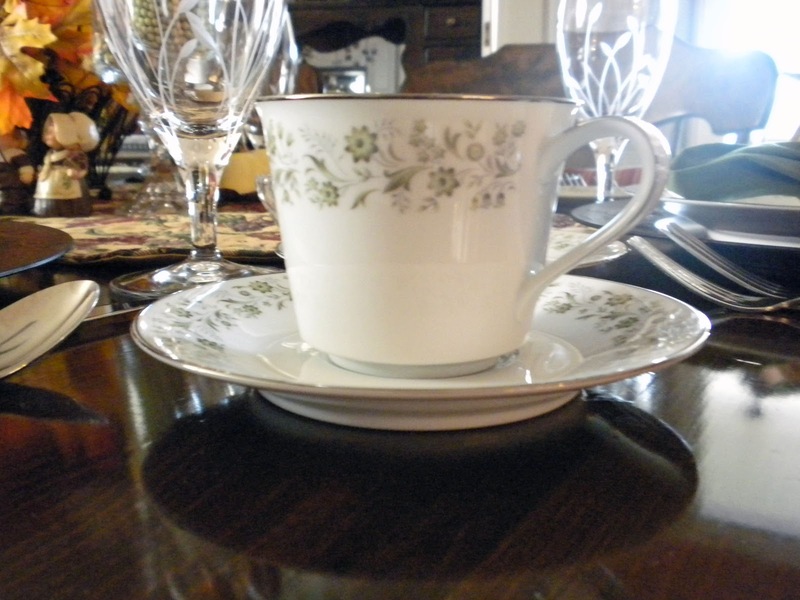 I'm using our wedding china -- Noritaki. 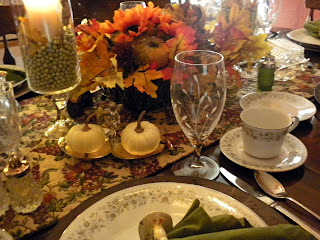 I have silver chargers that would match the trim on the china, but wanted to carry on the whole theme of fall & use these rusty-brown ones that I purchased at Walmart this year. I kind of like the contrast. The little turkey napkins rings are a good 35 years old & were purchased at a craft fair way back then. The napkins are from Walmart. Both salt & pepper sets were wedding gifts. The Man & I have been married 41 years. Do my things classify as "antique"? The stemware is Princess House. A bunch of my friends & I were on a Princess House Party "frenzy" a number of years ago, so I've amassed several things. I think it's very pretty. 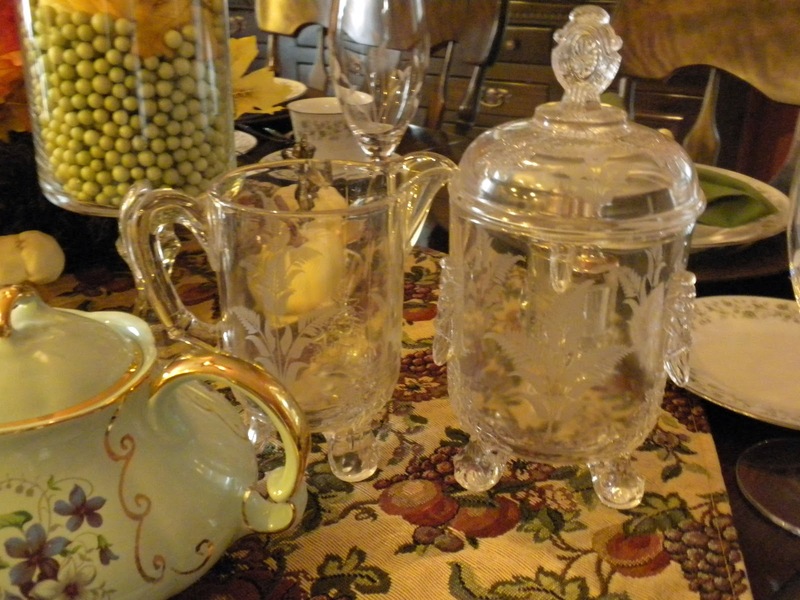 This cream & sugar set belonged to my Great, Great Grandparents. I just cherish these pieces. Can you believe how large they are? 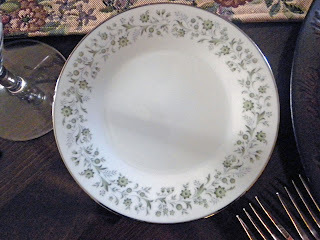 Wanted you to see a close-up of the china. I just love the little delicate flower trim. I've always loved the shape of these cups. I inherited this teapot, plus several others, from my mother-inlaw. I just love the shape & the colors. 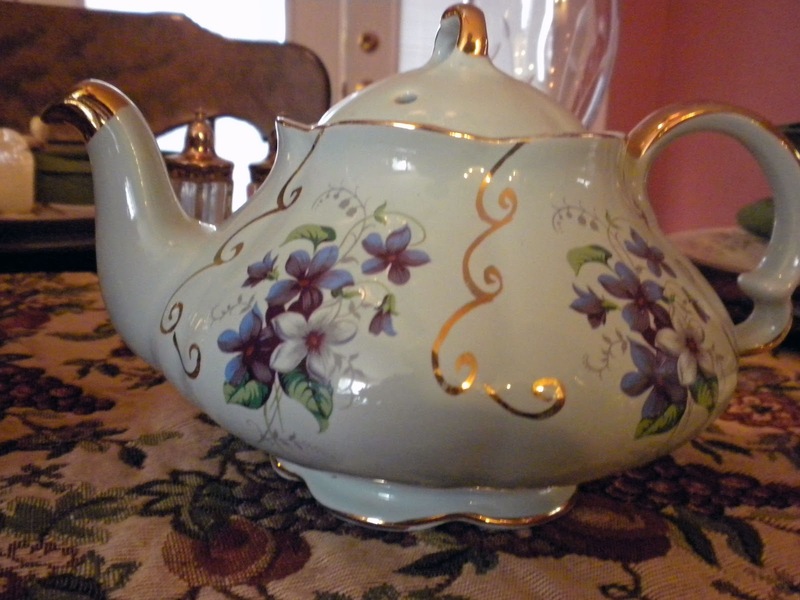 I also cherish knowing that she specifically wanted me to have her collection of teapots & cups & saucers. She was such a dear person. This next photo is just for fun. I am not a very good photographer, but I love having fun taking pictures. 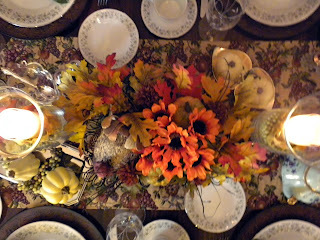 I had to take several snaps before I managed to get one that was somewhat centered -- just stretching out over the table to get a pic from above. Gives you a different perspective. 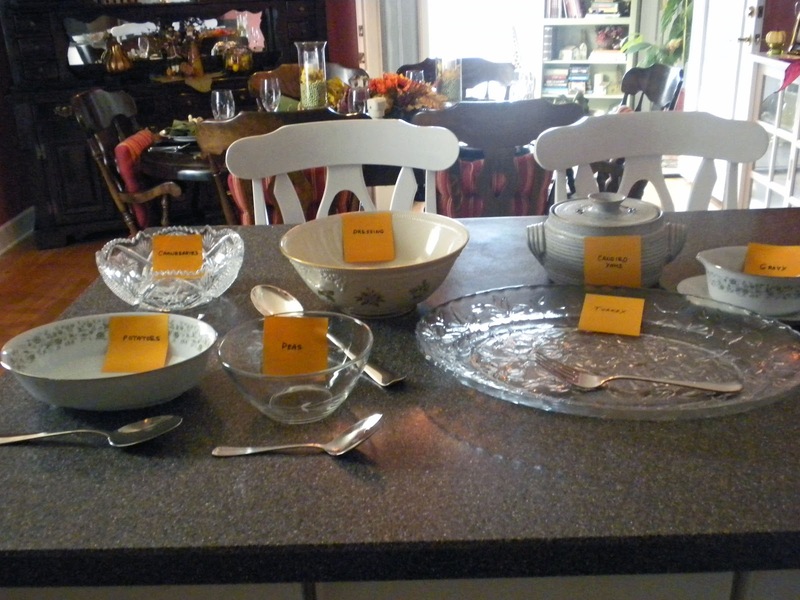 These are the serving dishes I will be using. Okay, here you see my rather "freaky" organizational mind at work -- everything is labeled. 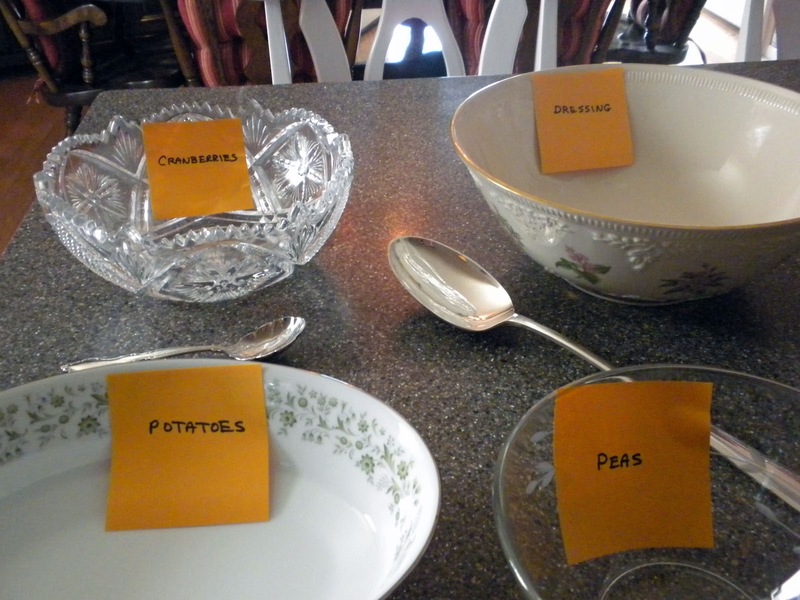 Seriously, I don't want to forget that gravy goes in the gravy boat! Yes, you can laugh at me because I'm laughing at myself right now. The gravy boat & medium bowl are part of the china set. The crystal bowl is Fostoria. The very large bowl is another piece from my sweet mother -inlaw. It's called a Constitution Bowl made by Lenox. The large platter is by Princess House, as is the small bowl. The covered pottery dish was handmade by a cousin. 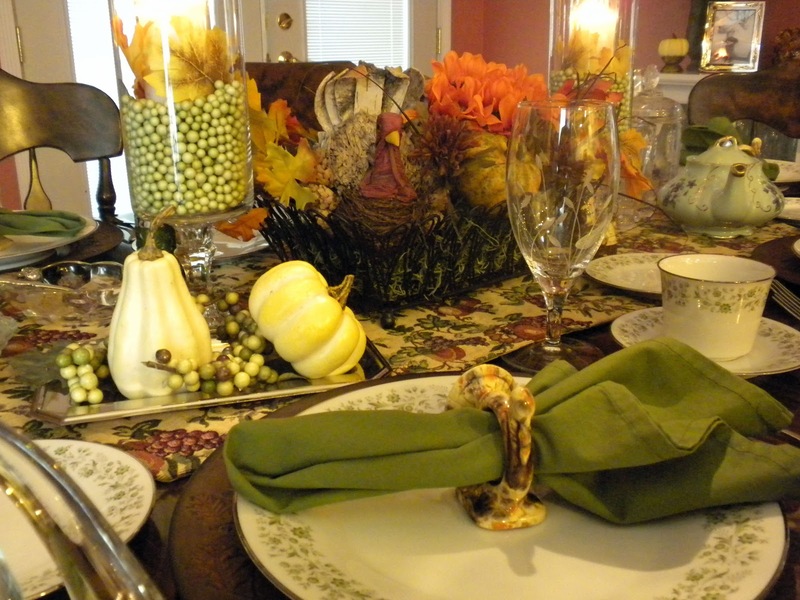 If you read my last post, you may recall that I said I had finished tweaking anything other than the table. Well, this really is the last tweak until I start all over again with Christmas. I brought in this tall dark green urn filled with some of my favorite fall florals to replace my smaller floral arrangement & little basket of berries & leaves. Why is that your last decision always seems to be the best? That's a wrap for Fall 2010. 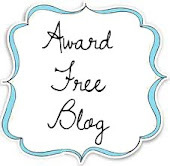 It has been gloriously fun because of starting this blog and meeting all of you wonderful blog-sisters. I hope you each have a wonderful Thanksgiving, however you may be celebrating it. Be safe and stop by to visit really soon. Just a tweak here & a tweak there. Just got back from my favorite big box store, with the turkey in tow, & a few extras goodies that were on sale. Truly didn't need any more fall/Thanksgiving decor items, but I felt it was my good customer responsibility to help the store personnel make room for the Christmas items. Am I correct here or what? Besides, the things I got were so cheap, how could I resist? 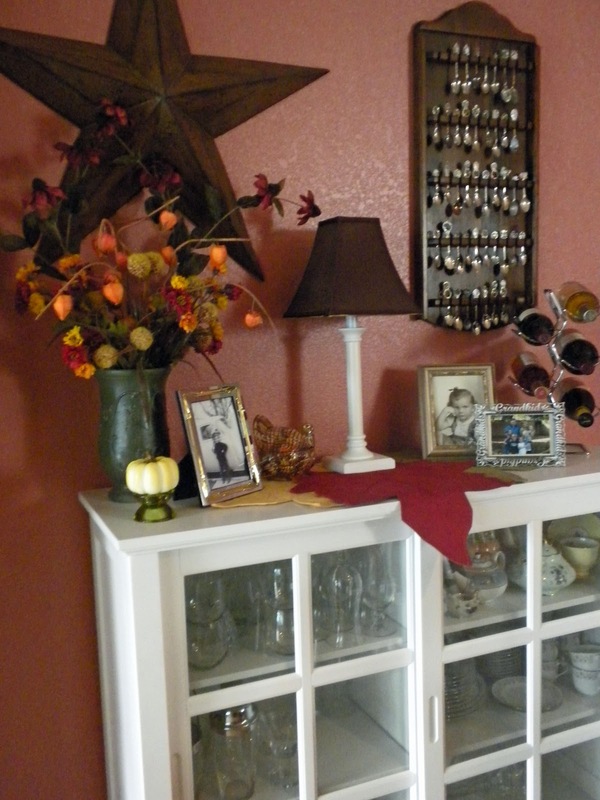 Once all the groceries were put away, I just had to decide on places to put the new items. 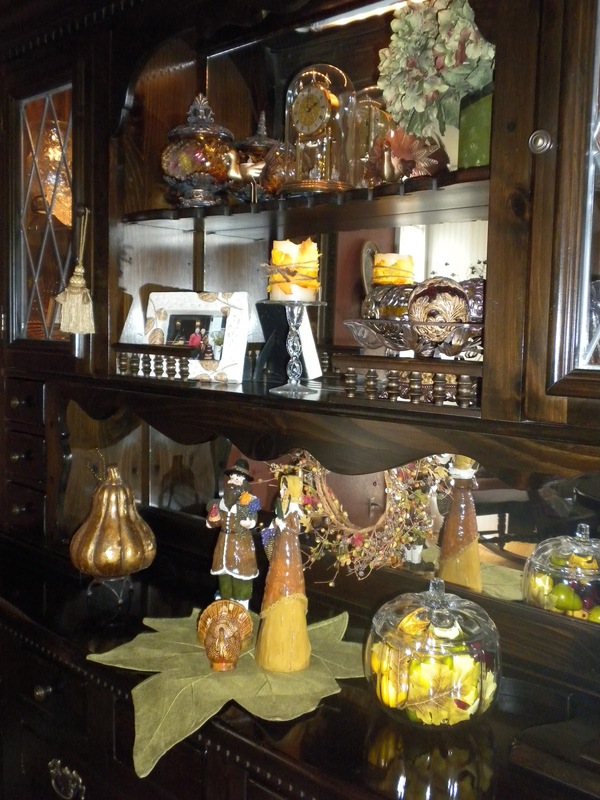 Since it had been all of a week since I tweaked anything in the dining room, it seemed only fitting that was the place to go with my new goodies. 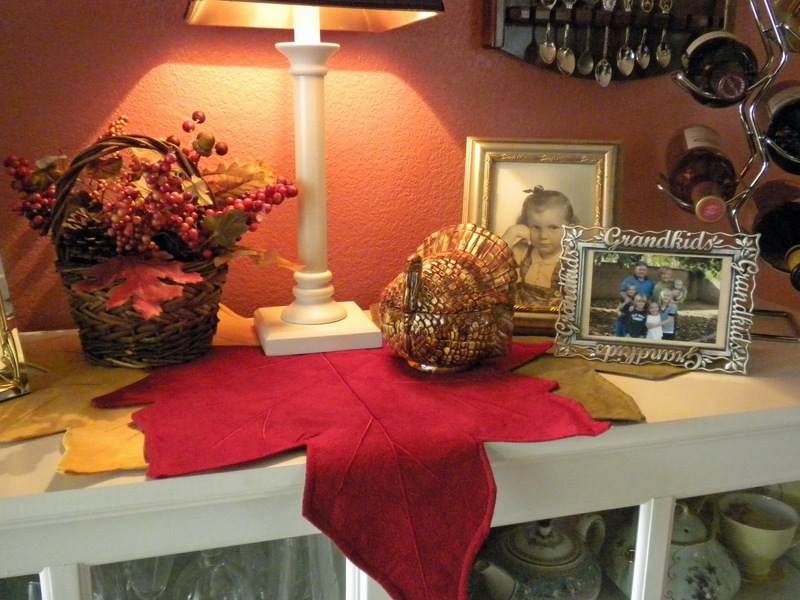 I thought these faux suede placemats ($1.50 each) would be nice as the first layer on the buffet. I like the way they add a bit of a warm glow to the surrounding area. The little basket with berries, pine cones, & leaves was another "on sale" item ($3). 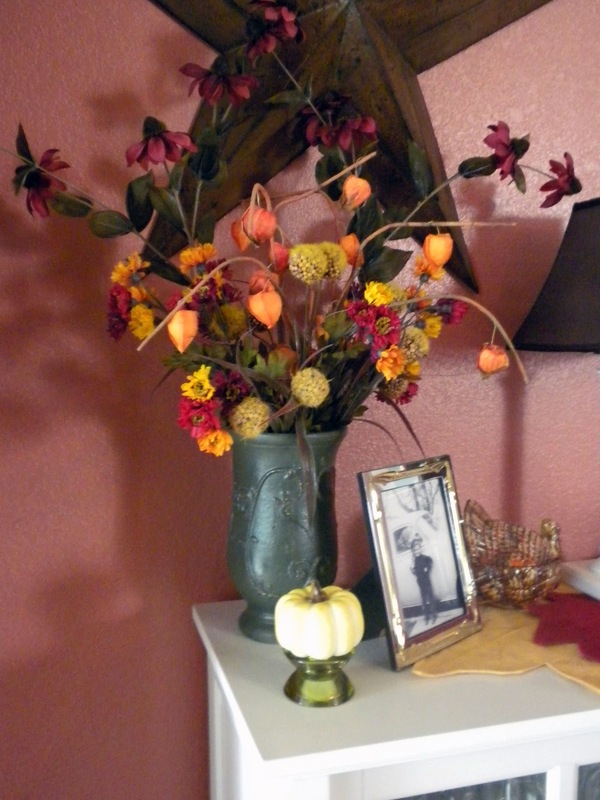 I can always tear it apart & use the flora in some other way -- maybe next year. 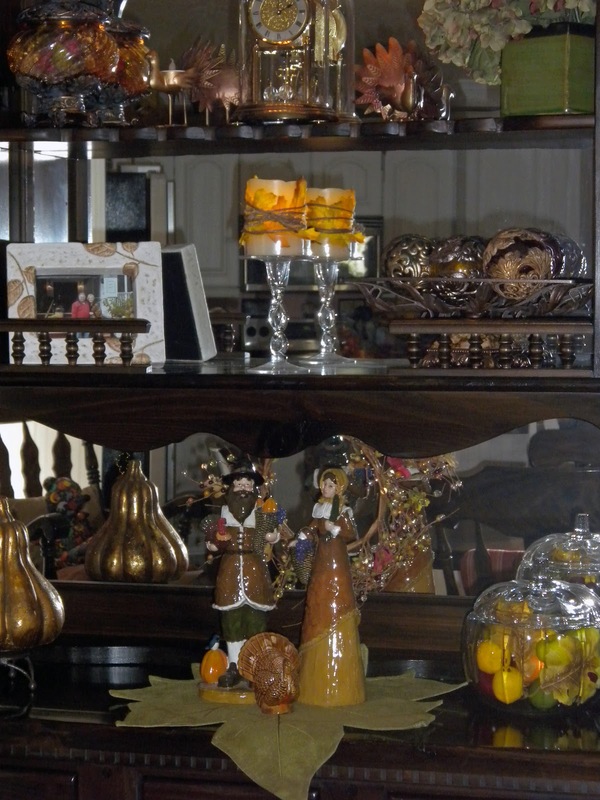 The turkey is actually a candy dish that I've had for 30 years. He's empty right now, but will soon have some treats for our granddaughters who are coming for Thanksgiving. I just moved things around a bit on my china cabinet. 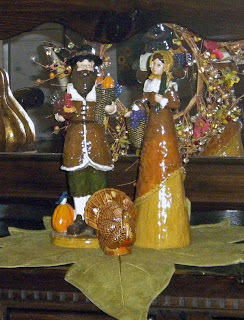 I don't think I ever showed you my Pilgrim couple, at least not up close. I've had them for a couple of years. Bought them at Big Lots, so they were cheap. They are really quite nice & seem very well painted. I've been watching for an Indian couple to add, but haven't found the same quality yet. 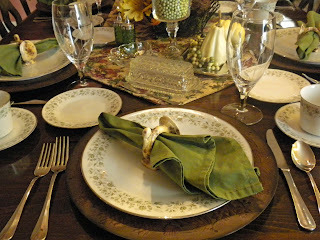 I used one of the faux suede placemats again as the base. 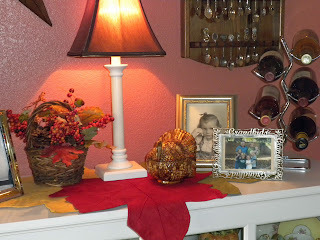 The little turkey matches the turkey candy dish. The small metal turkey tealights, on either side of the Anniversary clock, are from Michael's 2 years ago after Thanksgiving. I have the battery-type tealights in those -- fire hazard & all that. 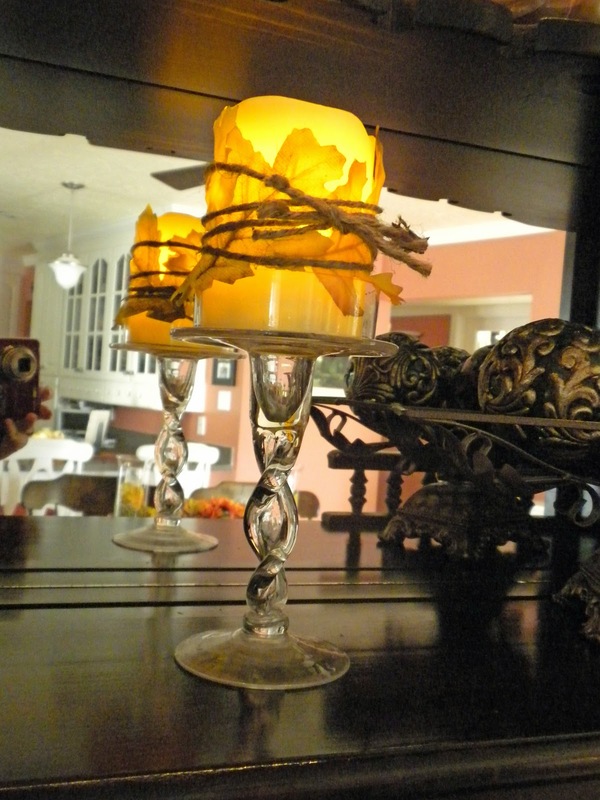 This is another battery-powered candle that I added some faux leaves & twine to just to add another dimension. 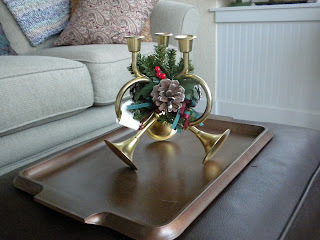 If you saw my post from my trip to GW, you might recognize the candle holder. It looks really nice here, I think. 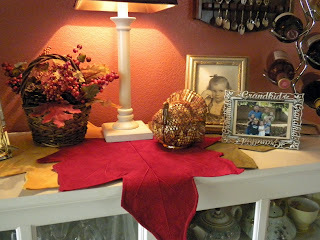 So that's probably going to be the last of the changes, except for the "Turkey Day" table, until I start the Christmas decorating. 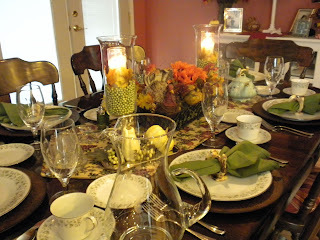 I'm so excited to be having our daughter & family with us for Thanksgiving. Thanks to all of you who have been stopping by. I try always to respond to new followers, but, if I miss you, please know I truly appreciate you. Please stop by again soon. 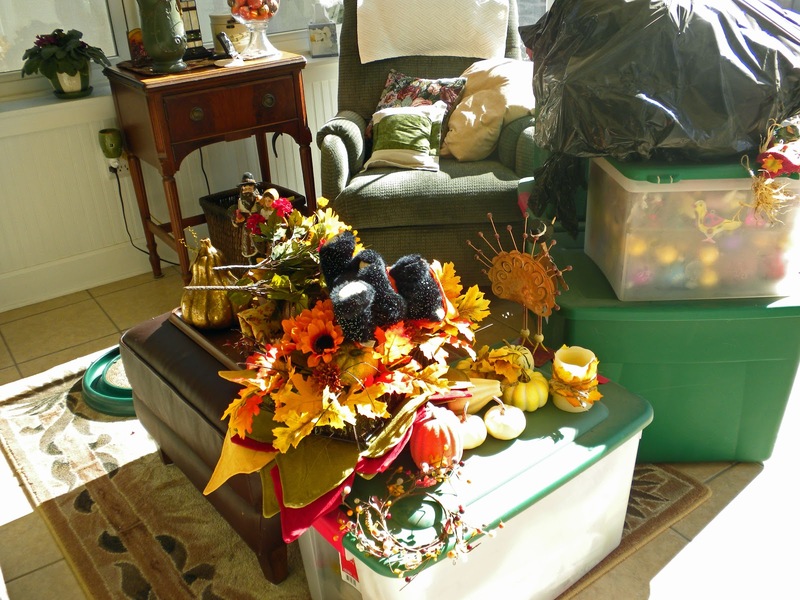 Over the river & through the woods, a "thrifting" we shall go! Yeh, well you wouldn't really want to hear me sing that. 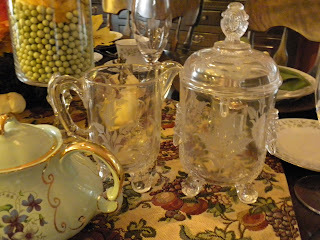 But I was out "thrifting" yesterday & found some fun things. Decided to also show you what I've snagged on a couple of other foraging trips. So, yesterday, I was in the vicinity of our GW store & popped in just to see if they had anything Christmasy. Yes, thank you, they had some good stuff. 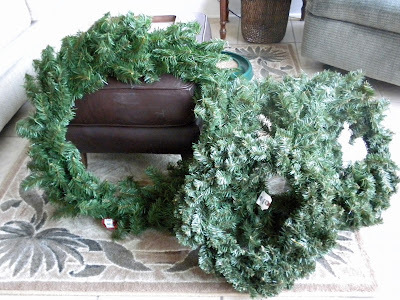 I purchased 4 wreaths, each were $2.99 with my senior discount (only time I acknowledge the senior classification is when it involves a discount--don't judge). The largest one is going to be used on my front porch. Two of the smaller ones will go on the garden shed doors, & the 3rd is to decorate my dining room light. 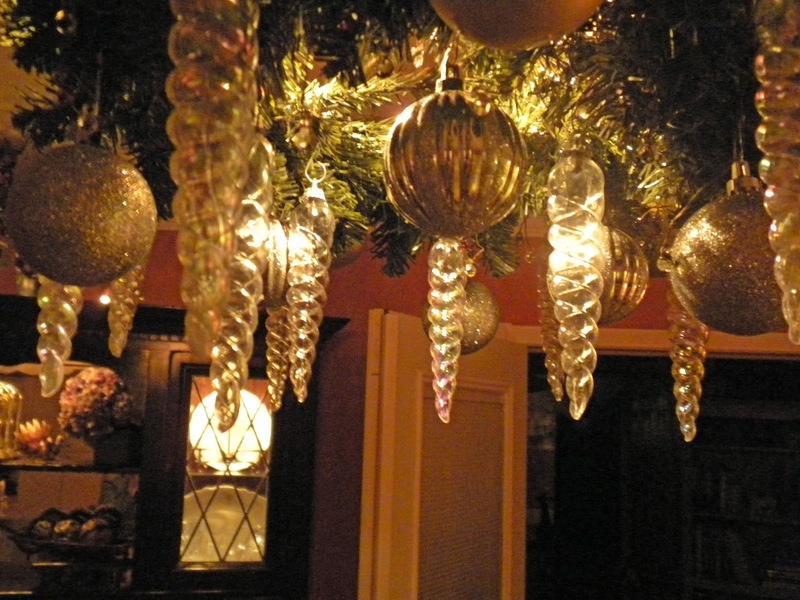 These are all very nice, very full wreaths. Can you believe this sweet Father Christmas was only $3.99? He's very clean & only needs a little fusing with his pack. No kidding, he really does have a pack on his back! He has such a sweet face. I don't generally do a lot with tapered candles & holders, but I found this at the same time as Father Christmas & the two just seemed to belong together. This needs a bit of cleaning, but I love that it is fashioned with French horns. 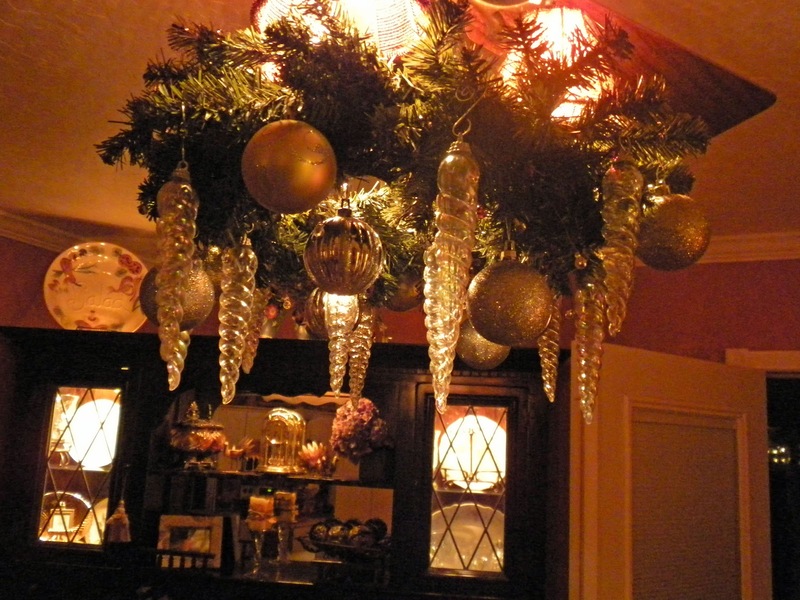 I may change the pinecones & greenery or not. It was $1.49. This is a collection of GW finds from a couple of weeks ago. 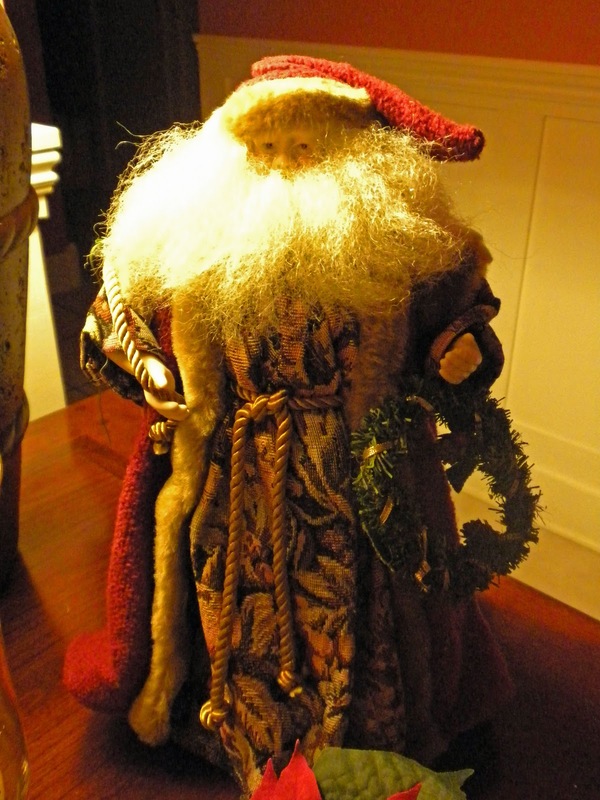 The wooden Santa is about 20" tall & the paint is in very good condition. He was $2.99. I didn't get a discount on this trip -- I must have looked younger, ha! 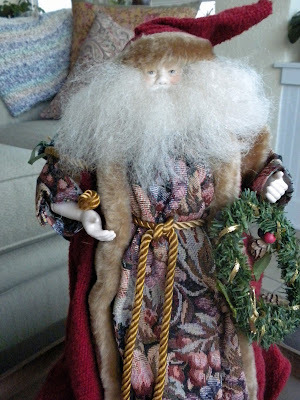 The box of large silver ornaments was $1, the cute red wooden sleigh was $1.49, the white porcelain Santa was just a buck. Love this basket. 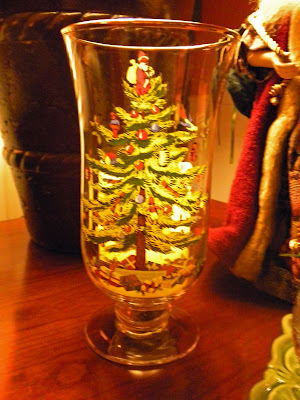 It's flat on one side & has little stamped trees all the way around. It's in great shape, but is intended to look weathered which I really like. It was 99 cents & will be part of my front porch decor. 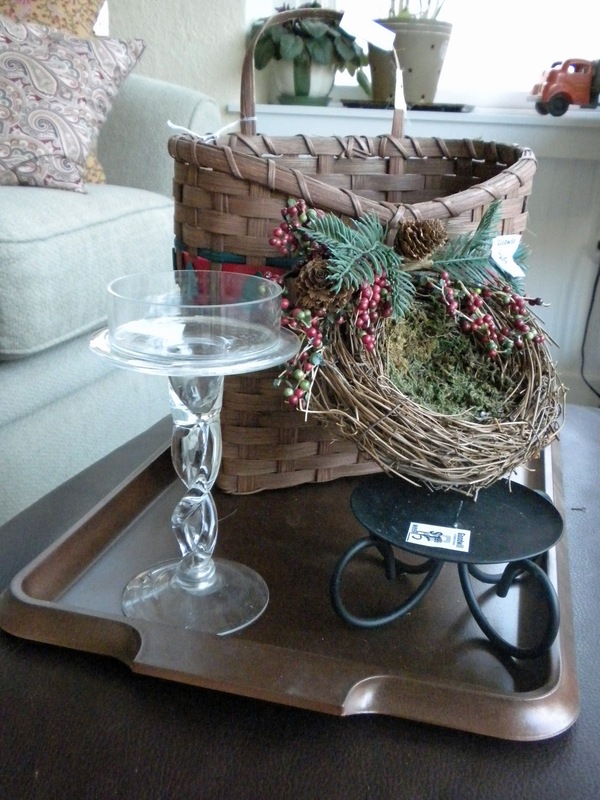 The bird nest for 50 cents will be finding a home outdoors, as well. 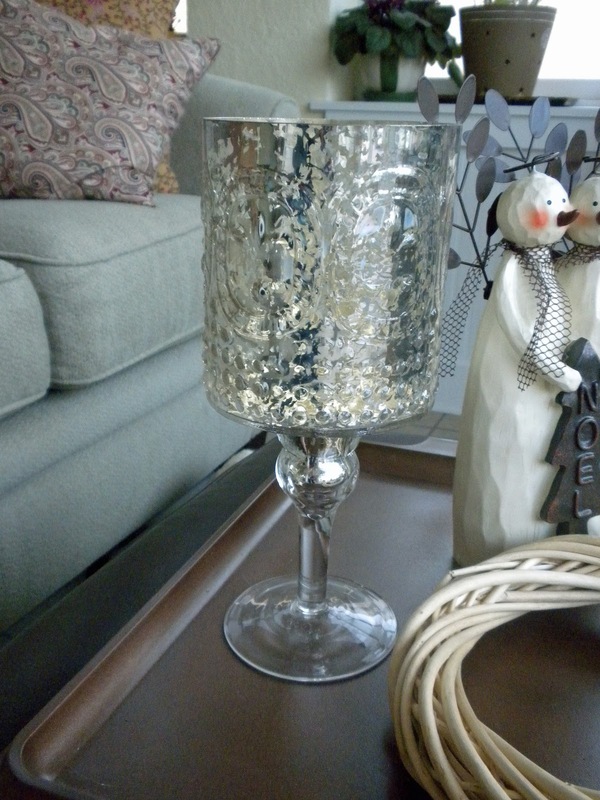 I'm always looking for candle holders & lucked out finding two. They were each a buck. I really like the twisted stem on the glass one. 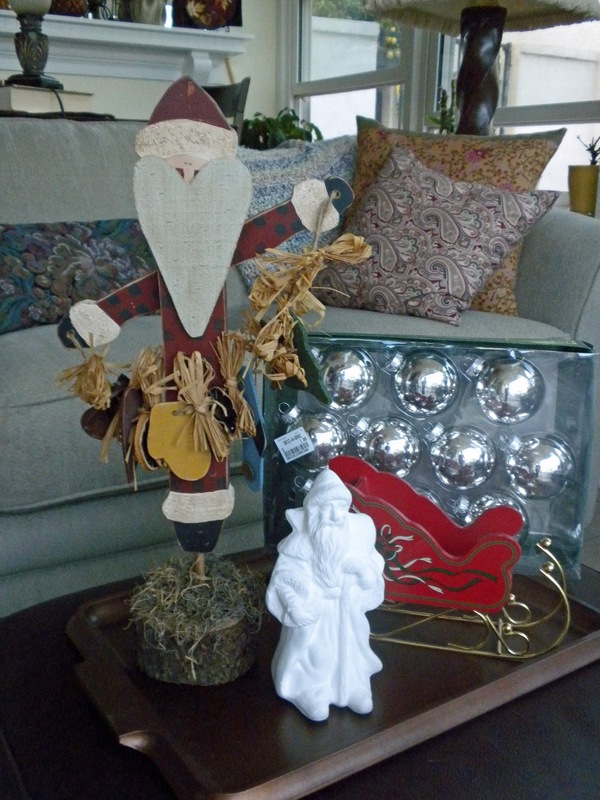 The faux mercury glass hurricane & cute little snow couple came from Ross's. They were each less than $5. The wreath is from the $ Store & well, it was a $1. I bought several of these wreaths that will adorn my kitchen -- can't wait to see, can you? Me, too! Just wanted you to see this hurricane up close. It really has a nice design. Can't wait to see a candle inside. 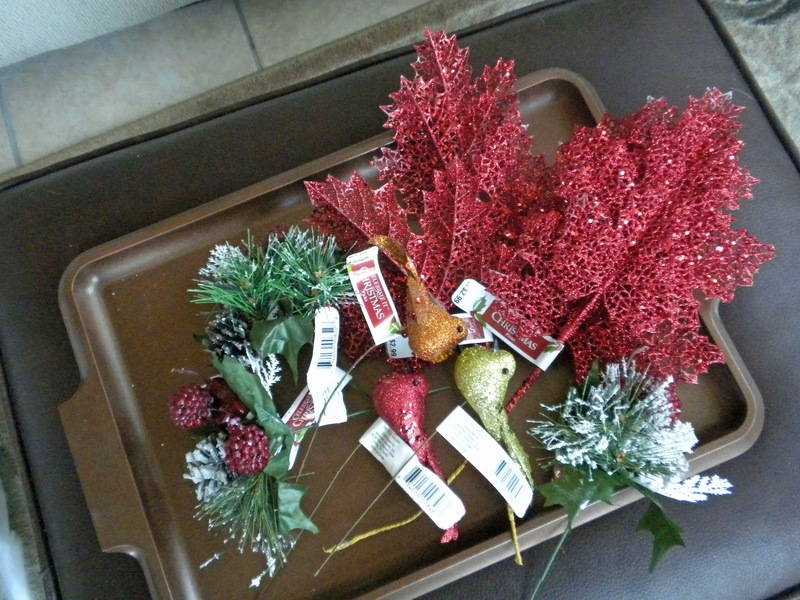 Lastly was a stop at Michael's for a whole bag of this kind of thing. It was all on sale for 40 to 50% off. Woohoo! Okay, that's as much time as I can spend in blogland right now. Have several sewing projects in various stages that must be attended to. Thanks for stopping by, & I hope you'll come again soon. Everyone, have a great day! And if not...He is still good! 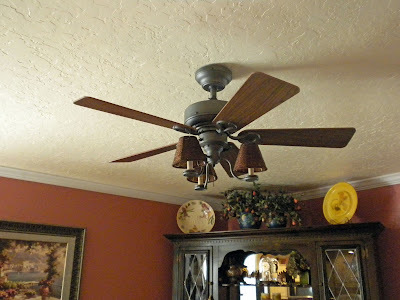 20 Life Changing Spring Cleaning Hacks To Deep Clean Your House! DIY Favor Boxes, Treat Boxes, & Paper Luminaries! Stampin’ Up! RETIRING List – Get your favorites before they are GONE! More Progress on the Flip House Facade! Show Off Saturday... the #10 Caddy Video Course! Hi Friends! Long time, no see! Welcome to my blog. I am so glad you are here. I'm a wife to "The Man" for 49 years, a mom to two wonderful married children, and Nana to six super-cute grandchildren. I'm also a "Kitty Mom" to Abby...she's actually an "old lady" but still has a kitty face! I love to cook, craft, sew, scrapbook, make cards, quilt, crochet, and my newest addictions - creative journaling, Bible journaling and planners. I'm lucky enough to have my own creative space and could spend endless hours playing in there. 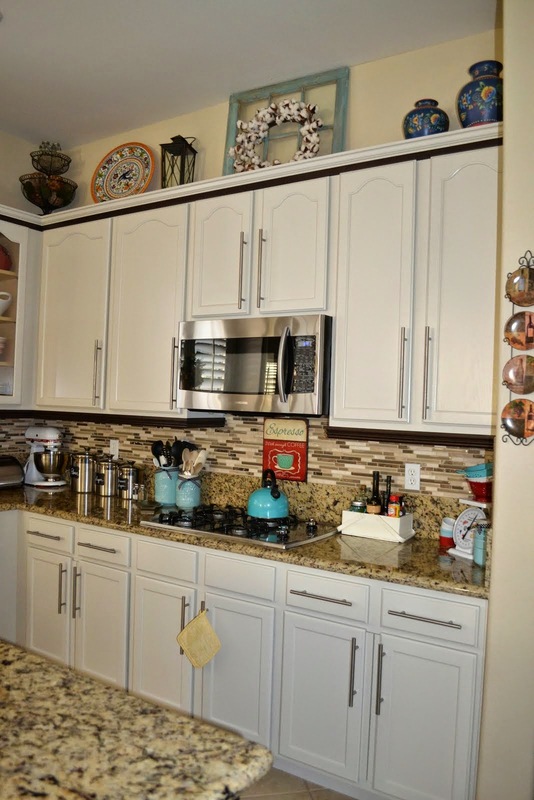 It's a good thing my "Happy Space" is very close to the kitchen, or cooking might take a backseat to everything else I enjoy doing! 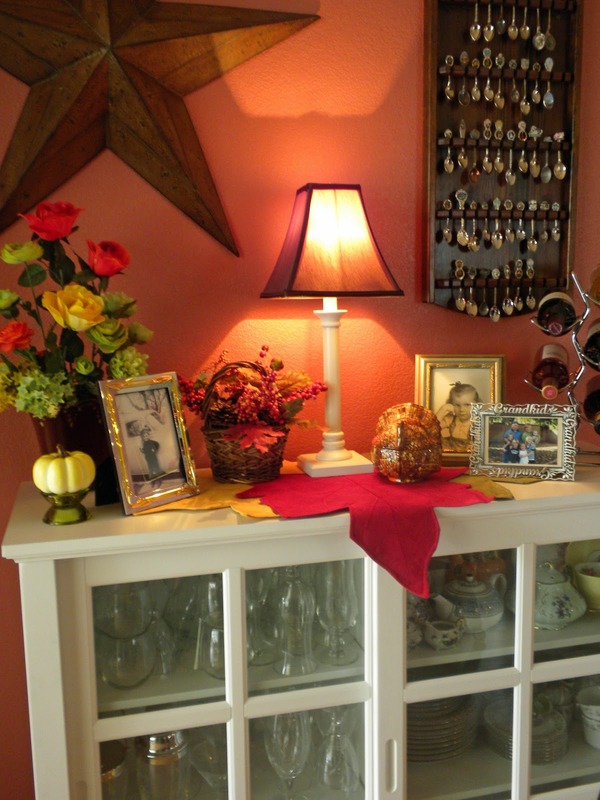 I also love home decor and making our home a friendly and inviting place for anyone who walks through our door. Family has always been everything to me, but even more so after battling breast cancer and winning! I have learned to not take anything for granted and to savor every moment. 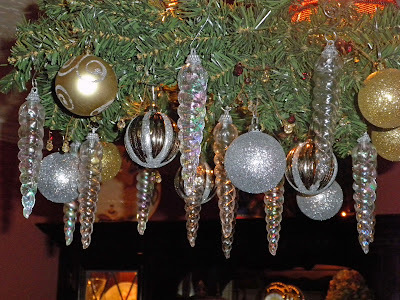 I hope you enjoy your time here on my blog, and please stop by any old time! Some Scenes from last year. 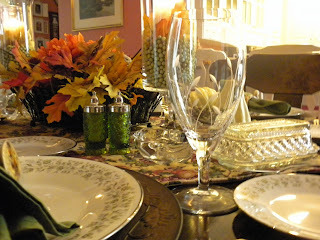 Just stuff to share & a new tablescape. New to Me & So Fun!